Sula the Cat does it again! Sula, parish cat at Old Mission San Juan Bautista, is a cat with a special mission: to comfort people in need. Every morning, she spends time with St. Francis, patron saint of animals, and receives guidance for the day. During Masses, led by the Holy Spirit, she seeks out whomever God wants her to comfort, and they report that she brings comfort, indeed. In her spare time, she writes books. 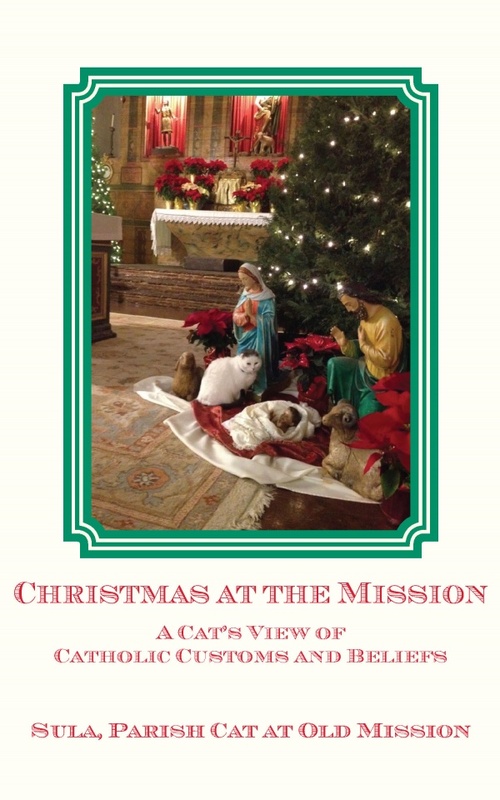 This time, she is writing about Christmas traditions and how she experiences them as a parish cat. Ever wonder where our various Christmas customs come from? Sula tells you about the history and the customs today, both mainstream American Catholic and Mexican American Catholic customs since both are part of her parish in California. Charmingly illustrated with an Eastern flavor by Russian artist, Zhenya Yanovich.